TRUE CRIME: An elaborate plan designed to murder a detective hell-bent on breaking up drug syndicates ended in an innocent young girl being blown up while playing with her sister. 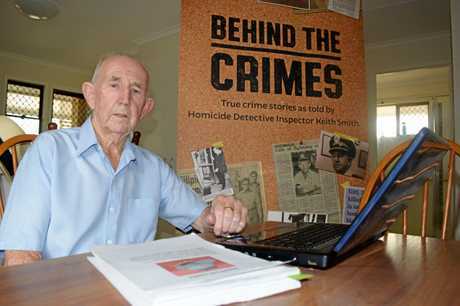 Detective Sergeant First Class Kevin Dorries, then the officer in charge of the Nambour Criminal Investigation Branch, had made it a personal quest to smash drug rings operating throughout the hinterland in the mid-1970s. New Zealand native and qualified schoolteacher Peter Vivian Wardrop was a player in the local drug scene. In March, 1974, Sergeant Dorries arrested Wardrop and charged him with cultivating a dangerous drug (marijuana). Police had seized Wardrop's 500-plant crop at Glenview, with a street value of $1 million. Remanded in custody in Brisbane's Boggo Road Jail, in Dutton Park, Wardrop was losing thousands of dollars in cannabis sales. At the time Wardrop told Sgt Dorries he'd been recruited as an informer for a Brisbane Drug Squad detective who'd been investigated internally over suspect activities and involvement with known drug offenders on the Sunshine Coast. That detective was transferred to a uniform position in north Queensland and Wardrop knew of the internal scrutiny. Sgt Dorries didn't buy the story and charged Wardrop. Dorries said at this time Wardrop said to him, "This is where you get killed, or blown up". Fast forward to August, 1974. Wardrop had been released on bail from Boggo Road Jail after a few months. On August 7, about 1pm, homeowner Heinz Otto Gartner took his two daughters, Merrilyn, 3, and Lisa, 2, around to the home he was renovating at 60 Sixth Ave, Maroochydore, near the popular Cotton Tree area. 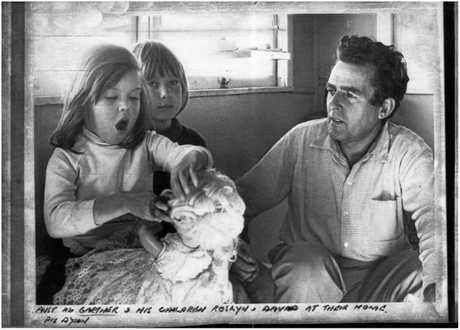 As Heinz worked outside his fibro and timber lowset house his daughters went inside to play. Unbeknown to Heinz and his daughters, the night before, an anonymous call had been made to the Nambour Police Station. A message had been left for Sgt Dorries, whose patch included Maroochydore, that a stash of heroin had been left in the house Heinz was renovating. Sgt Dorries had organised an early morning raid along with other detectives, but when he arrived to the house completely closed up and vacant, stood his officers down to make further inquiries, as he would be unable to charge anyone for possession if drugs were found. 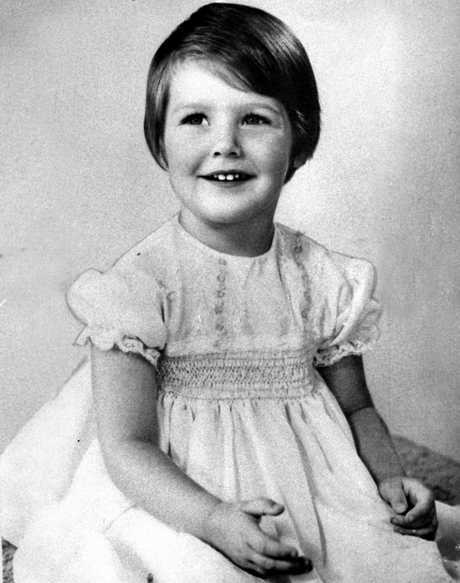 That afternoon, as Sgt Dorries was continuing to make inquiries about the anonymous tip-off, little Merrilyn Gartner opened the door of the kitchen cupboard beneath the sink as she played inside with her sister. It would be the last thing she ever did. Opening the cupboard tripped the detonator of the nail bomb sitting in the cupboard. The explosion blasted Merrilyn and her sister Lisa across the room, through the fibro walls and into the front yard. Merrilyn was killed instantly, while Lisa was severely injured. The blast happened next door to the ambulance centre. A two-litre paint tin jammed with lead-head roofing nails, screws, bolts, a nine-volt battery and gelignite sticks had ended the life of the little girl. Forensic investigators described it as "a nail bomb designed to kill". 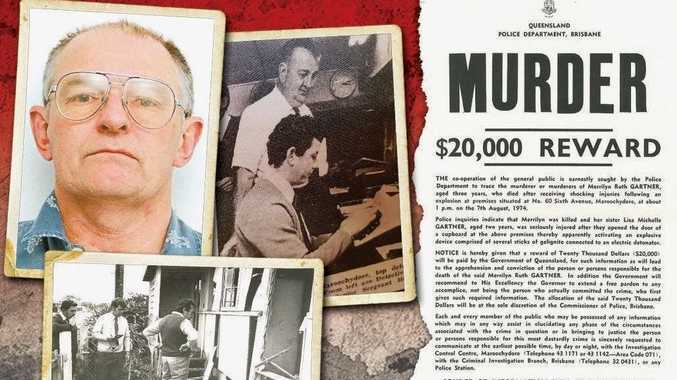 Keith Smith was working the afternoon shift with the Consorting Squad in Brisbane when the call came through to assemble a team of investigators and head to Maroochydore. A caravan had been quickly renovated and the first-ever Mobile Police Command had been set up. Mr Smith, who retired as a detective Inspector, was one of those picked. When they arrived local detectives had already figured out the bomb had been a trap and Sgt Dorries had been the intended target. A few weeks before the blast some gelignite sticks and detonators were stolen from a Noosa Council depot in Pomona. 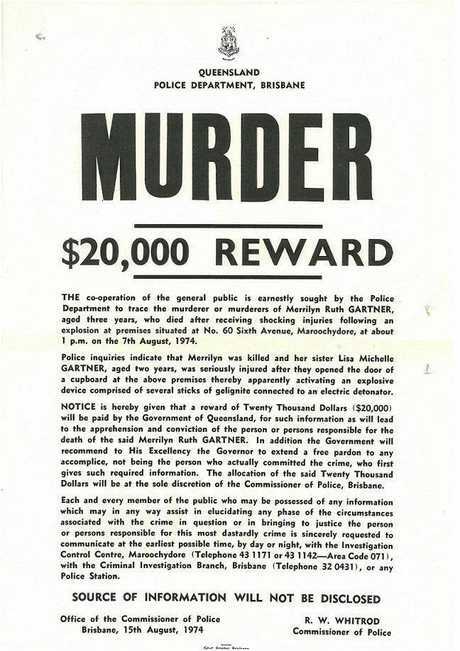 Immediately after Merrilyn's murder Sgt Dorries nominated Wardrop as the one he thought responsible for the explosives theft and the blast, given the previous threat Wardrop had made during his arrest. Detectives didn't approach Wardrop or his associate, Gary Thomas Taylor, while they were busily investigating the pair's movements in the weeks before and up to the explosion. 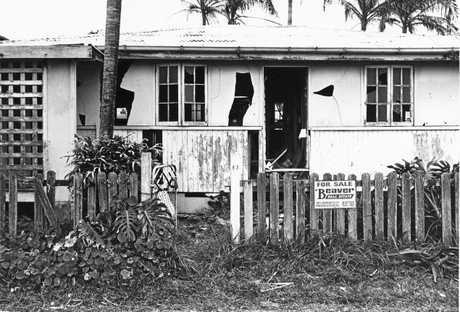 The pair had been living in Graceville but were regular visitors to the Coast. Mr Smith said they would've been aware of how intense the investigations were into them, as detectives ran out massive inquiries within the region's drug scene. "Many local druggies scattered to avoid the heat," Mr Smith said. Every prisoner who'd been in remand at Boggo Road Jail at the same time as Wardrop while in custody was interviewed. Mr Smith said many inmates waived their usual position of non-compliance with police and volunteered information. "Many prisoners were happy to help because the explosion had killed an innocent girl and injured another," Mr Smith said. 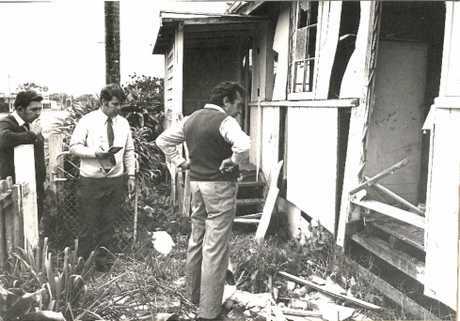 A week after the explosion a $20,000 reward was released by Commissioner Ray Whitrod for information that led to the conviction of the person responsible for Merrilyn's murder. That sparked a flood of information. Wardrop had been seen reading bomb-making material while on remand at Boggo Road and had spoken to other prisoners about it. The investigators had their break when another prisoner told them in detail how he'd taught Wardrop the art of bomb-making. 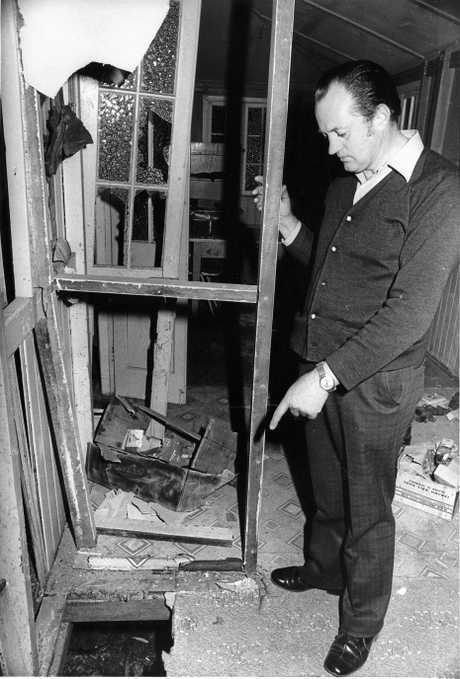 The bomb described to detectives was almost identical to the bomb which had killed Merrilyn. Importantly, those details had been kept quiet, so only someone with intimate knowledge would have known. "It was crucial, as the make-up of the bomb hadn't been made public," Mr Smith said. Another inmate said they'd heard Wardrop saying the bomb "was meant for Dorries, not the kid, Dorries should've got it". As detectives built a strong, circumstantial case against Wardrop, another piece of the puzzle fell into place. In August, 1973, Wardrop was arrested in Tully, north Queensland, for cultivating drugs. During interviews with detectives he asked what would happen to him if the police, or the drugs and exhibits they'd collected, were blown up. Other witnesses described Wardrop telling them he had enough gelignite to "blow up Nambour Police Station with Dorries inside". 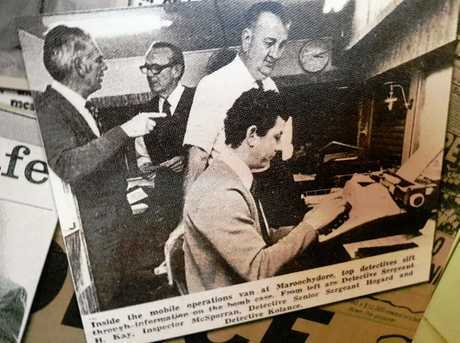 As the investigation dragged on, two senior detectives, Detective Inspector Ron Redmond and Detective Sergeant Howard Kay, flew to New Zealand to investigate Wardrop's background. Tragically, Sgt Kay suffered a heart attack and died while in New Zealand, delivering a significant setback to the case. Mr Smith remembered how Sgt Kay's death had steeled the investigating team and spurred them on to make sure they got a result. Testing on boltcutters seized from Wardrop's Graceville home showed they'd been used to cut chain at the council explosives depot in Pomona. Taylor, visibly disturbed by the explosion which had killed Merrilyn, proved to be the weak link. When eventually questioned by detectives he admitted his role in the theft of the explosives, but denied any involvement in the bombing. Taylor said Wardrop had "used him". At no stage did Wardrop make any admissions of guilt. There were 60 witnesses at the committal hearings, who'd been meticulously gathered by detectives from all corners of the country. 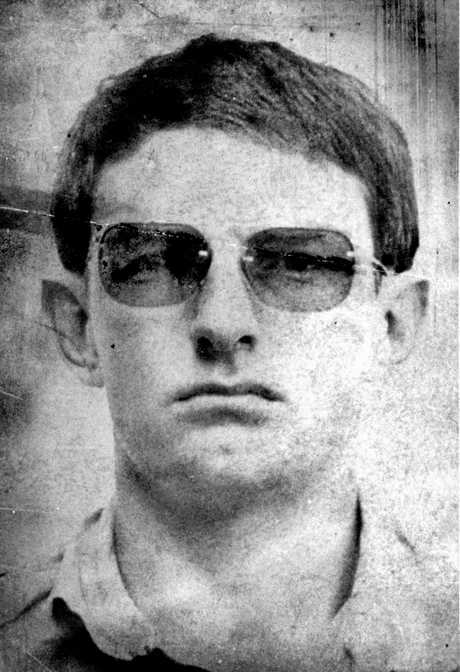 On November 14, 1974, both Wardrop and Taylor were committed to stand trial for murder in the Brisbane Supreme Court. Taylor was found dead, hanged in his cell by his belt, on December 13, 1974. He'd committed suicide before the trial, which started on April 28, 1985. The trial ran for 39 days with 78 witnesses called. After the mammoth trial jurors deliberated for just five hours before they found Wardrop guilty of Merrilyn's murder. Wardrop took the verdict calmly and a year later filed an appeal. Mr Smith said the appeal was upheld and a retrial ordered, a bitter blow for investigators. Detectives desperately worked to track down and subpoena witnesses again, with nationwide alerts put out to find some of them. The retrial went ahead in Brisbane Supreme Court and thankfully the jury found Wardrop guilty again and he was convicted of murder for a second time. He was sentenced to life imprisonment, but Mr Gartner said at the time Wardrop could've been sentenced to 50 years' prison "but it wouldn't have brought back our little girl". 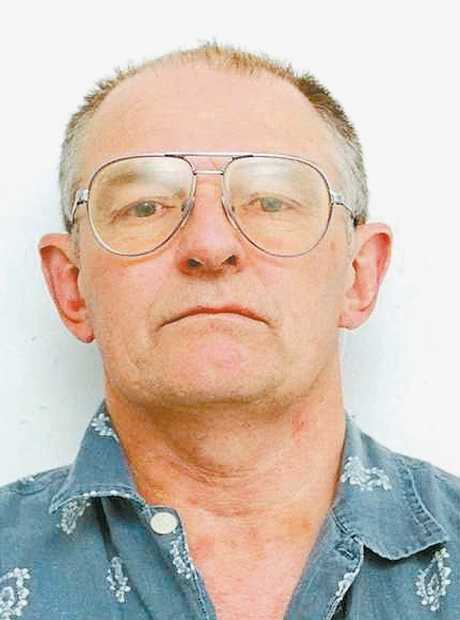 Wardrop served 14 years in jail before the State Cabinet, in 1989, decided to release him from prison and deport him back to New Zealand, barring him from returning to Queensland, under threat of being jailed again. "He never showed remorse," Mr Smith said. Mr Gartner was quoted in The Courier-Mail on November 8 saying it was "better to string up these guys, it's cheaper than keeping them in jail". In 2004 Wardrop, then 57 and living in Hawke's Bay, New Zealand, was sentenced in the Napier High Court to three years and three months' jail after being busted with a commercial cannabis operation. Armed police busted Wardrop with a sophisticated indoor growing operation as well as 208 cannabis plants, 170g of cannabis leaf and more than 3000 cannabis seeds. Police claimed the operation was worth about $600,000 a year, while Mr Smith said the operation had the potential to earn Wardrop millions of dollars each year. Wardrop had admitted to police he'd been growing cannabis for five years, but denied it had been a commercial set-up. The High Court Justice who sentenced Wardrop said it was clear there was the potential for significant financial gain from the operation.